Strong demand for senior loans is allowing some US corporations to push leverage to new highs. 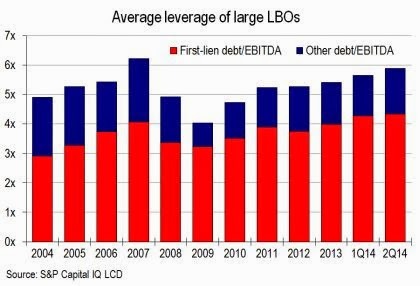 While the average leveraged buyout (LBO) transaction total leverage is just below the 2007 peak, the average leverage through the first-lien debt hit an all-time record this quarter. 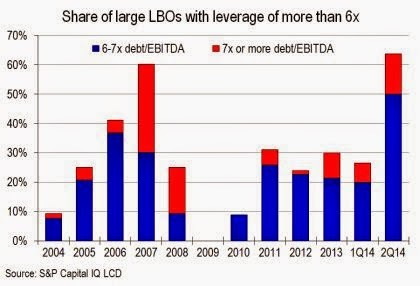 Similarly, even though we don't see as many 7x or 8x leverage LBOs as we did in 2007, the proportion of LBO's with 6x and greater hit a new record of 64%. So much for the Guidance on Leveraged Lending (see post). The Fed can attempt to limit the supply of such leverage by going after the banks who arrange this financing. But banks don't hold much of this debt on their balance sheets and instead syndicate it to funds and CLOs and non-bankng entities (such as Jefferies for example) can step in to do these deals. Therefore an attempt to reign in high risk lending should start by taming the demand. The demand however comes from the lack of yield in fixed income, and only when rates begin to rise will we see a slowdown in high risk financing. Of course the longer it takes to get there, the more painful the adjustment will become.